Correlation is non-transitive: How rich people can vote Republican and rich states can vote for Democrats. How Can Rich People Vote Republican and Rich States Vote for Democrats? Wisconsin’s richest county is Waukesha. George W. Bush crushed Al Gore like a grape there, 65–31, while Gore narrowly won statewide. My doctor once recommended I take niacin for the sake of my heart. Yours probably has too, unless you’re a teenager or a marathon runner or a member of some other metabolically privileged caste. Here’s the argument: Consumption of niacin is correlated with higher levels of HDL, or “good cholesterol,” and high HDL is correlated with lower risk of “cardiovascular events.” If you’re not a native speaker of medicalese, that means people with plenty of good cholesterol are less likely on average to clutch their hearts and keel over dead. But a large-scale trial carried out by the National Heart, Lung, and Blood Institute was halted in 2011, a year and a half before the scheduled finish, because the results were so weak it didn’t seem worth it to continue. Patients who got niacin did indeed have higher HDL levels, but they had just as many heart attacks and strokes as everybody else. How can this be? Because correlation isn’t transitive. That is: Just because niacin is correlated with HDL, and high HDL is correlated with low risk of heart disease, you can’t conclude that niacin is correlated with low risk of heart disease. Transitive relations are ones like “weighs more than.” If I weigh more than my son and my son weighs more than my daughter, it’s an absolute certainty that I weigh more than my daughter. “Lives in the same city as” is transitive, too—if I live in the same city as Bill, who lives in the same city as Bob, then I live in the same city as Bob. But many of the most interesting relations we find in the world of data aren’t transitive. Correlation, for instance, is more like “blood relation.” I’m related to my son, who’s related to my wife, but my wife and I aren’t blood relatives. In fact, it’s not a terrible idea to think of correlated variables as “sharing part of their DNA.” Suppose I run a boutique money management firm with just three investors, Laura, Sara, and Tim. Their stock positions are pretty simple: Laura’s fund is split 50–50 between Facebook and Google, Tim’s is one-half General Motors and one-half Honda, and Sara, poised between old economy and new, goes one-half Honda, one-half Facebook. It’s pretty obvious that Laura’s returns will be positively correlated with Sara’s; they have half their portfolio in common. And the correlation between Sara’s returns and Tim’s will be equally strong. But there’s no reason (except insofar as the whole stock market tends to move in concert) to think Tim’s performance has to be correlated with Laura’s. Those two funds are like the parents, each contributing one-half of their “genetic material” to form Sara’s hybrid fund. Friendship (whether the real kind or the Facebook kind) isn’t transitive; the friends of your friends aren’t necessarily your friends. If they were, you’d have only as many friends of friends as you have friends. In fact, you’re likely to have more like a quarter-million. Relations like “better than” sound like they ought to be transitive. But even here there are some wrinkles. In 1994, a pre-election poll for the prime ministership of Denmark, voters preferred Hans Engel to Uffe Ellemann-Jensen by a narrow margin of 39 percent to 38 percent. But Poul Nyrup Rasmussen beat out Engel in a proposed head-to-head matchup, 47–42. This seems to suggest that Rasmussen was a better match for the voters’ desires than Engel, and Engel in turn better than Ellemann-Jensen. But in the same poll, voters chose Ellemann-Jensen over Rasmussen. It seems like a paradox. But the sad fact is that “preferred by voters in a head-to-head matchup” does not have to be a transitive relation, which leaves it an interesting philosophical question who the “best” of the three candidates really is. Lest you think this weirdness is a product of human folly, consider the famous Efron dice. There are four dice, none of which is numbered in the usual way. Die A has numbers 2, 2, 2 , 2, 6, and 6; die B has numbers 1, 1, 1, 5, 5, and 5; die C has numbers 0, 0, 4, 4, 4, and 4; and die D has all six faces numbered 3. If two players roll dice trying to get the highest number, and one is rolling A and the other is rolling D, the D player is going to win two-thirds of the time, because two-thirds of the time is how often player A gets a 2 instead of a 6. On the other hand, in a C vs. D matchup, D gets beaten by C two-thirds of the time. What’s more, you can check that B beats C two-thirds of the time as well. So B is a better choice than C, which is a better choice than D, which is a better choice than A. So what happens when you pit A against B? You’ve probably figured out where I’m going with this: A, the “worst” die, beats B two-thirds of the time. Like upscale areas everywhere, from Silicon Valley to Chicago’s North Shore to suburban Connecticut, Montgomery County supported the Democratic ticket in last year’s presidential election, by a margin of 63 percent to 34 percent. Meanwhile, like almost all of rural America, Franklin County went Republican, by 67 percent to 30 percent. First of all, this “everywhere” is a little strong. Wisconsin’s richest county is Waukesha, centered on the tony suburbs west of Milwaukee. 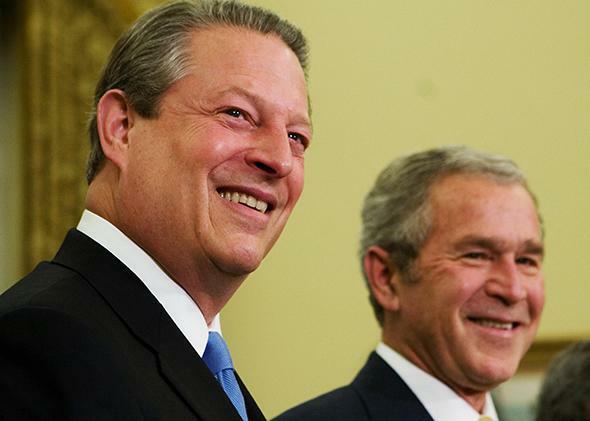 George W. Bush crushed Al Gore like a grape there, 65–31, while Gore narrowly won statewide. Still, Brooks is pointing to a real phenomenon. In the contemporary American electoral landscape, rich states are more likely than poor states to vote for Democrats. Mississippi and Oklahoma are Republican strongholds, while the GOP doesn’t even bother to contest New York and California. In other words, being from a rich state is positively correlated with voting Democratic. But statistician Andrew Gelman found that the story is more complicated than the Brooksian portrait of a new breed of latte-sipping, Prius-driving liberals with big tasteful houses and NPR tote bags full of cash. In fact, rich people are still more likely to vote Republican than poor people are, an effect that’s been consistently present for decades. Being rich is positively correlated with being from a rich state, more or less by definition. And being from a rich state is positively correlated with voting for Democrats. But because correlation is non-transitive, it doesn’t follow that being rich is correlated with voting for Democrats. In fact, pace David Brooks, it’s exactly the opposite.